By popular demand, I have added Leagues to FantasySCOTUS.net. I have already added the top 100 Schools, based on the US News & World Reports, but you can create your own leagues. Just log in, and click the Leagues link, and then Join or Create a league! Also in the works are a League Scoreboard feature, A Cert or No Cert Game (the winner will receive the Certiorari Crystal Ball Award), a forum, and some other cool stuff. And this morning at 10 a.m., Predictions of the 10th Justice will be premiering at www.AboveTheLaw.com. Welcome to the first installment of Predictions of the 10th Justice, brought to you by FantasySCOTUS.net. FantasySCOTUS.net, the premier Supreme Court fantasy league, has over 1,300 members, who have made predictions on all cases currently pending before the Supreme Court. In this feature, we analyze these predictions, and try to explain how the Supreme Court will resolve top cases. The first case we will look at is Citizens United v. Federal Election Commission, commonly known as the Hillary Movie case. 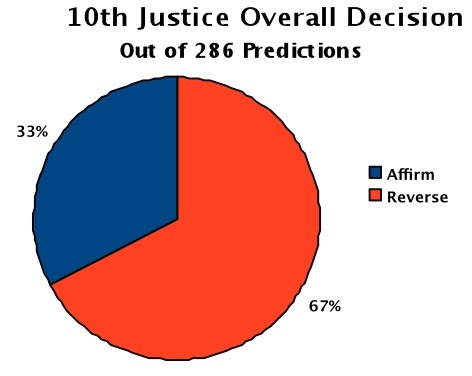 Out of 286 predictions, 192 members (67%) predicted that the Supreme Court will likely reverse the lower court’s decision regarding the case, and 94 members (33%) predicted that the Court will affirm the lower court’s decisions. 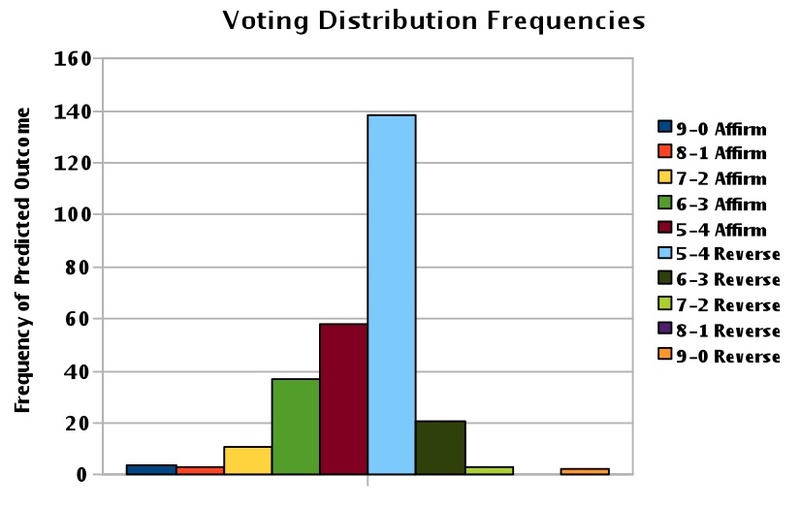 Next we will explore the decision vote distributions and how the Justices will vote. On this bar graph, the 9-0 and 8-1 Affirm splits each garnered less than 5 votes, along with 7-2, 8-1, and 9-0 Reverse. This graph reinforces the predicted outcome from the first chart. Most members are predicting a 5-4 Reverse, while those predicting an Affirm were more moderately split, slightly favoring a 5-4 split over a 6-3 split. Overall, the 10th Justice predicts a 5-4 decision reversing the lower courts holding. But how will each Justice vote? Predictions, after the jump. In true appellate fashion, memberships fees are three-tiered; they range from free (for students and the unemployed) to $10. If you’re a betting man, woman, or Groupie, Clerquette says: Christmas has come early this year! Indulge! If you’re searching for a gift that will keep on giving — at least from October to late June/early July — look no further! FantasySCOTUS.net will keep your favorite groupie busy, away from productive activity, and unable to engage in telephone conversations while formulating bets for months to come. Hey: at least there’s no draft. With 1,200 members and counting, this is a perfect stocking stuffer! FantasySCOTUS.net. The 10th Justice Predicts the Court Will Reverse Citizens United v. FEC 5-4 (Hilary Movie Case). But how will Kennedy vote? Out of 286 predictions, 192 members (67%) held that the Supreme Court will likely reverse the lower court’s decision regarding the case, and 94 members (33%) held that the Court will affirm the lower court’s decisions. Next we will explore how the decision vote distributions and how the Justices will vote. On this bar graph, the 9-0 and 8-1 Affirm splits each garnered less than 5 votes, along with 7-2, 8-1, and 9-0 Reverse. This graph reinforces the predicted outcome from the first chart. Most members are predicting a 5-4 Reverse, while those predicting an Affirm were more moderately split, slightly favored a 5-4 splitover a 6-3 split. Overall, the 10th Justice predicts a 5-4 decision reversing the lower courts holding. Posted in FantasySCOTUS. Comments Off on FantasySCOTUS.net. The 10th Justice Predicts the Court Will Reverse Citizens United v. FEC 5-4 (Hilary Movie Case). But how will Kennedy vote? To date, about 1,000 people have signed up. Professors can now take advantage of the discounted $5 signup fee. Enjoy. I am making several big changes (like developing Leagues and some other cool stuff). Stay tuned, and tell your friends. I had the pleasure of chatting with Ashby Jones of the Wall Street Journal Law Blog, and he wrote a pretty good feature about FantasySCOTUS.net. Check out the interview here. We have no idea, LBers, if this idea is going to flop or take off. But it sounded sorta fun to us. If you wind up giving it a whirl, and loving or loathing, let us hear about it.